Induction Heated Jacket Rolls｜Products｜Tokuden Co., Ltd.
Our proprietary induction heating technology enables the Jacket Roll to heat itself. The roll surface temperature is controlled within a ±0.5°C deviation by the jacket installed in the roll shell, enabling thermal processing with high accuracy. This technology allows manufacturers to produce uniform products. Thermal media evaporate and condense repeatedly inside the dozens of vacuumed spaces (Jacket Chambers) inside the roll shell. The roll shell absorbs and disperses the thermal energy created by these reactions, resulting in a uniform temperature on the roll surface. Magnetic flux occurs when an alternating current is provided to an induction coil. This induces a current on the inside of the roll shell, and the resistance heat causes the roll shell to generate heat. High-temperature thermal energy is achieved from the direct generation of heat by the roll shell itself. keeps power loss to a minimum. Cores made up of a collection of strips of insulated magnesium formed into an involute shape greatly reduce iron loss (heat generated by the core itself that cannot be used effectively). This technology also keeps power loss to a minimum. 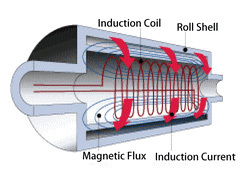 Induction heating draws on the magnetic field which is produced by the electric current applied to the induction coil. This system provides high temperatures and precise control in 1℃ increments from room temperature to 400℃. The heat-pipe principle maintains a uniform temperature both across and around the roll. Temperature profile remains uniform whether or not a thermal load is applied. Since Jacket Rolls use only electricity as their heat source, there is no need for additional facilities or special construction. The equipment requires minimal space and is easy to operate. Because there is no oil, vapor or combustible material to leak, the work environment stays clean and safe. The temperature control system incorporates a microcomputer. The Jacket Rolls use no ignitable substances, so operation is also safe and low maintenance.